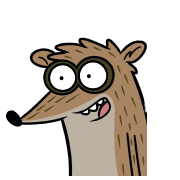 It's up to you to rescue Rigby from a videogame in Escape from Ninja Dojo! Rigby bought a bootleg copy of Ninja Dojo, BAD DECISION! Now he's stuck in the game and his only hope of getting out is to beat all 30 levels! With Mordecai as your guide, you'll have to launch Rigby through a slew of deadly ninjas, treacherous traps, and epic levels! Cartoon Network is the best place to go for free online games!